We want to give the discerning customer a choice. We want to offer home furnishings that have a story to tell, that have been created by human hands, that are unique yet affordable, and that somehow have imprinted upon its fibers, generations of skill, culture, and tradition. You are probably wondering what “Saffron” and “Marigold” have to do with home furnishings..
“Marigold”: in India the marigold flower is used as an offering, and that is precisely what this site is. An offering of one of India’s oldest textile arts, hand block printing, applied to a distinctive range of globally inspired home furnishings. “Saffron”: saffron is a spice prized for its rich golden hue and delicate aroma. It is so treasured that it is used sparingly with reverence, and is considered the ultimate garnishing. 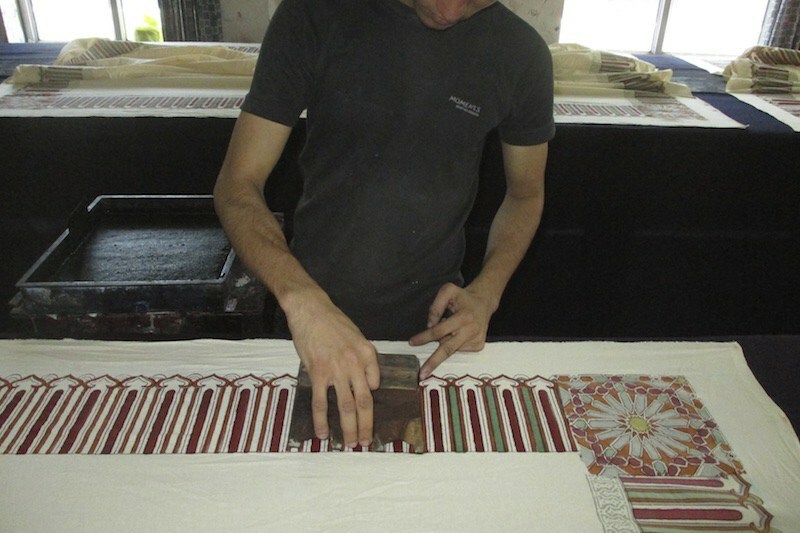 We hope that our textiles are a prized offering that will add a special touch to your living space. But why would you want to buy Saffron Marigold? We are glad you asked. here are 5 reasons why..
1. You get great value at a fair price for original, globally inspired designs. Ride a magic carpet and experience the world through our exclusive textiles. From lotuses floating languidly in temple ponds to dappled light filtering through the intricate fretwork of a Moroccan palace, each textile carries within its folds a wondrous tale. Pick your journey and we’ll have a textile to take you there! From design to delivery, we do everything in house. There are no “middle men” and no “department store markups”, which allows us to offer you our handcrafted linens at a fair price, set substantially lower than similar high quality textiles from boutique stores. A win-win! 2. You design your soulful home around hand made, usable art. 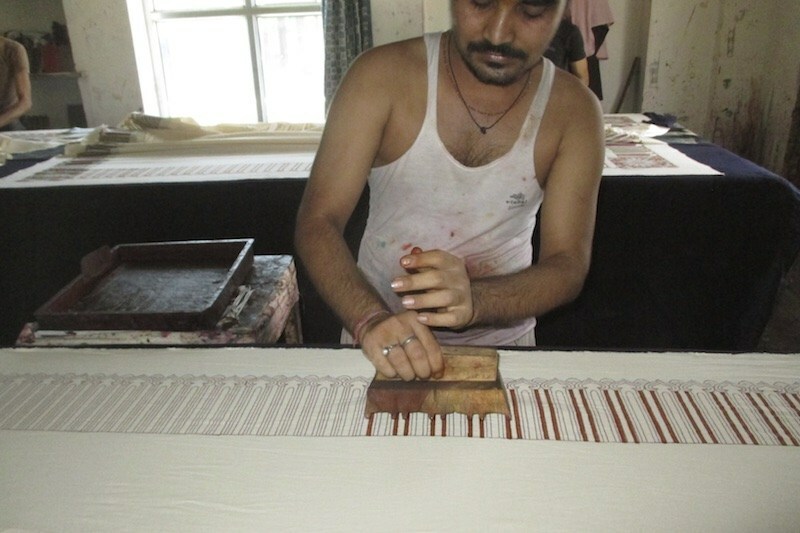 Our range of hand block printed textiles are exclusively designed and then printed in our studio in the desert state of Rajasthan, where entire villages derive their livelihood from the craft of hand block printing. One gets the sense of being caught in a time warp as camel drawn carts, laden with logs of shesham and bales of fabric, sashay their way down chaotic dusty streets, enabling with every step the metamorphosis of their cargo into gorgeously hued hand block printed textiles. 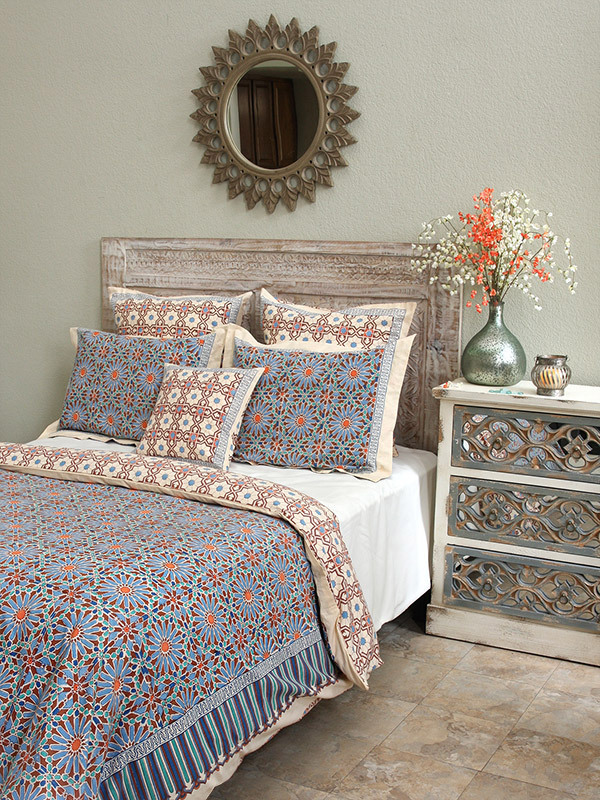 The block-printed cottons of Jaipur have been renowned for their exquisite pattern, and coloring for centuries. Traditional prints featured delicate floral sprays, spaced evenly on a white, pastel blue or yellow ground of fine cotton. While designing our collections, it has been our endeavor to fuse traditional flavor with a good dose of modern aesthetic sensibility. Patterns chiseled into woodblocks transform fabric into works of art, celebrating color, pattern and the slow-cloth, handcrafted way of life. 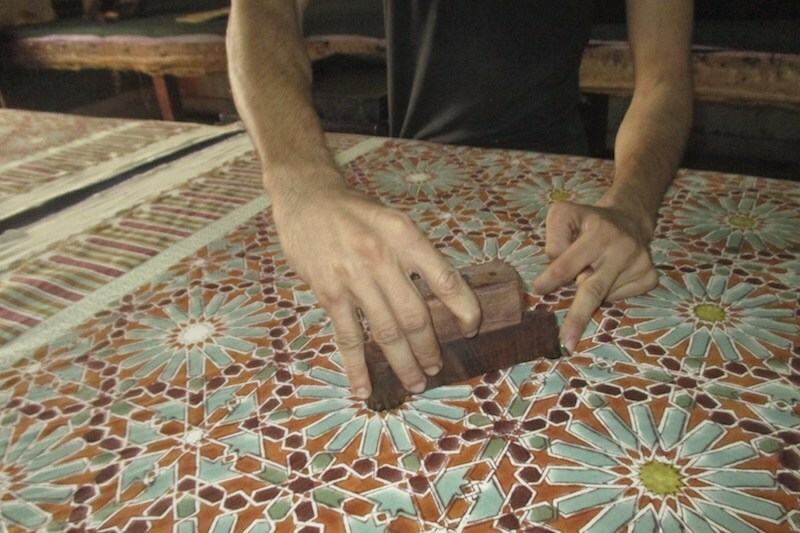 The tradition of hand block printing has continued to exist in a parallel universe, stubbornly resistant to industrialization, and is to this day practiced without the aid of mechanization or computerization. 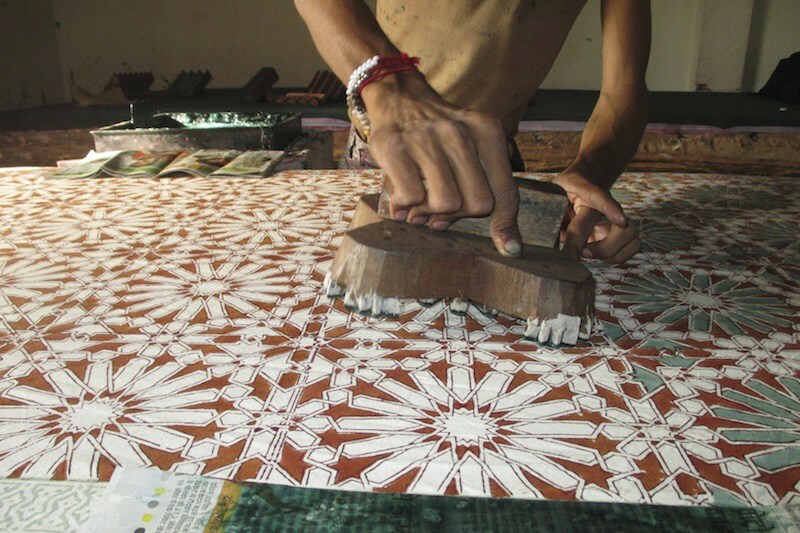 It is this defiant indifference to mechanization that gives block printing the aura of a pure craft form and makes block printed textiles so esteemed. Traditionally, these textiles played an integral part in village life. However, with the introduction of mill prints and synthetics, these textiles are gradually losing their appeal to the village consumer. It is only a growing appreciation of this craft in urban and international markets that is keeping this ebbing craft alive. 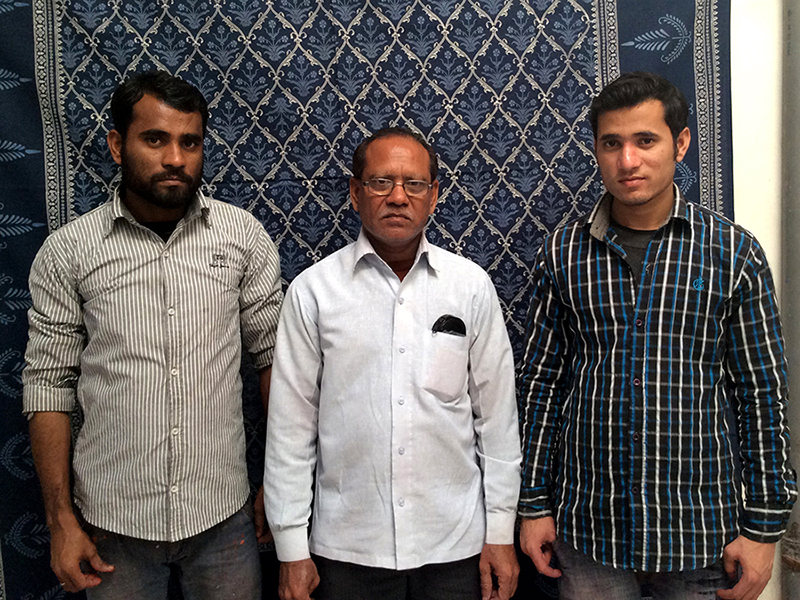 Meet Rafiq (center), our master artisan, who now mentors his two sons, Imran and Irfaan. Your support helps us invest in training apprentices to ensure the survival of this difficult craft for another generation. We believe this legacy keeps our world and our home connected, beautiful, and soulful. 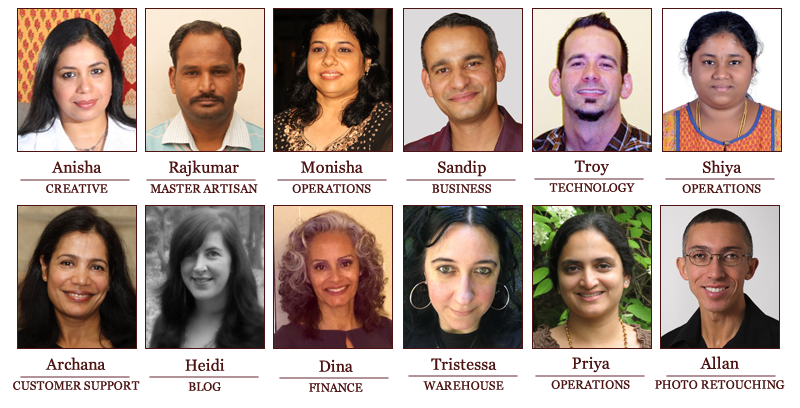 You are helping build a fair trade business where beautiful work is done, and a positive social impact is made. Now, that is a reason to celebrate! We remain optimistic and excited about the work ahead and feel confident that, with your support, we will continue to make a difference in many lives and make this world a little better. We promise this is going to be an exciting site. As the seasons change there will always be something new, so please join us by entering your email address below. We would love to stay in touch. 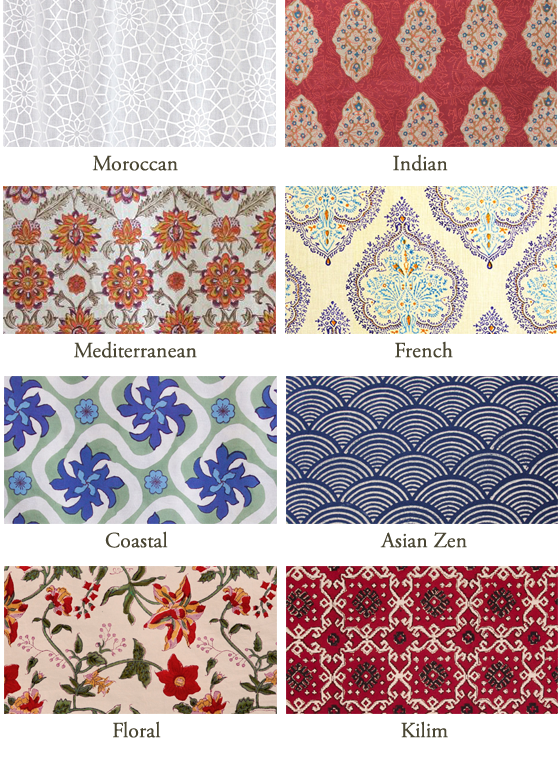 We look forward to the opportunity of being of service to you and to bring these gorgeous textiles to your home.